Nothing is better on a Saturday afternoon than a good grilled steak. Here in Kitchener, you won’t find a better steak anywhere than Brady’s Meat and Deli. He’s famous for his baseball steaks, however I’m quite partial to the Rib Eye. Either work excellent in this recipe. Clean your grill really well and wipe it down with some olive oil (put a little olive oil on a damp paper towel and wipe the grill where you’re cooking the steak). If you’re using wood chips, add them now and quickly close the lid! Let the steak cook on the indirect heat for 20-30 minutes for medium well, flipping once at about the 15 minute mark. 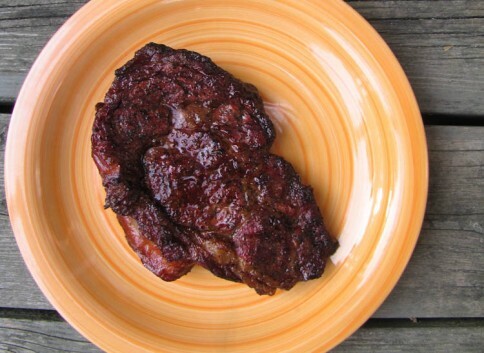 Even though you did not use a marinade, or a sauce, this is the most flavorful steak you will ever have in your life! Also reheats great for steak sandwiches.